The Quick Options toolbar is on the left side of the caption (title) bar. The Quick Options toolbar enables / disables the Tabbed Toolbar, and minimizes or displays the Take Command menu ribbon. 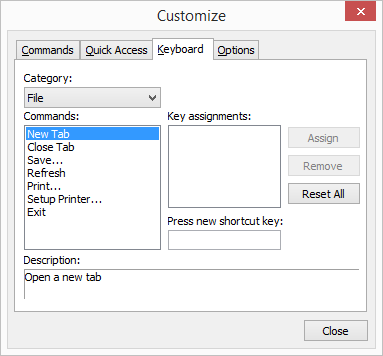 Quick Options can also display the Customize dialog, which allows you to add commands to Quick Options, drag & drop icons to the tabbed toolbar, and change the keyboard shortcuts.